Minister for Health Leo Varadkar has announced that commercial sunbed ‘happy hours’, and ‘unlimited’ or ‘free’ use of sunbeds, won’t be permitted from March 2nd in an effort to reduce skin cancer. Users will be required to wear protective eyewear and won’t be able to use sunbeds without supervision, in order to minimise damage to their skin and eyes. New hygiene standards will be put in place. The new regulations will also require sunbed business owners to display warning signs, provide information on the risks, and ban health claims. “The more that someone uses a sunbed, the higher the risk they will get skin cancer. The incidence of skin cancer is increasing faster than any other type. More than 850 new cases of melanoma are reported in Ireland each year, with 150 Irish people dying annually. So this phase of sunbed measures is all about making sure that adults know the risks,” Minister Varadkar said. “More and more evidence is emerging that using a sunbed without protective eyewear can damage the eye and potentially cause cancers. These new measures will ensure that protective eyewear which meets safety standards is used,” he added. The new regulations comprise the second phase of measures under the Public Health (Sunbeds) Act. The first phase was introduced last year with the ban on under-18s using sunbeds. The new provisions will be enforced by HSE Environmental Health Officers and penalties will apply. Sunbed businesses will also be required to notify the HSE which will establish a list of notified sunbed businesses. “I want to thank the HSE, the Environmental Health Association, the Irish Cancer Society and Marie Keating Foundation and others for their support. 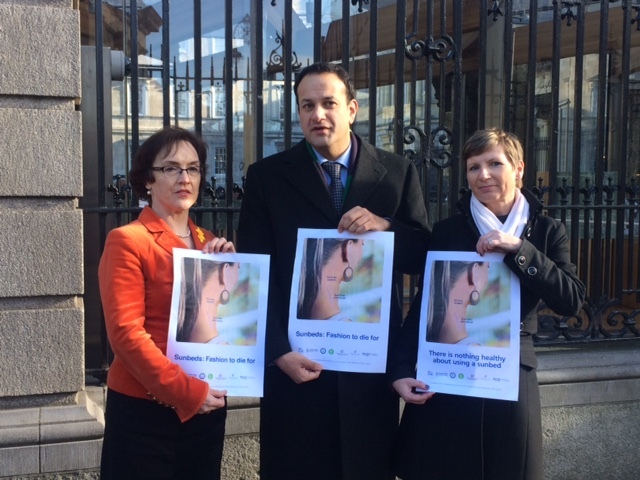 This sort of co-operation is exactly what the Healthy Ireland initiative sets out to achieve,” Minister Varadkar said. Last year a prohibition on sunbed use by under-18s came into effect. The Minister for Health has now signed 5 Statutory Instruments (including a commencement order) which come into force on 2 March 2015. Click here for more. Skin cancer is the most common type of cancer in Ireland and is a particular problem for Irish people because of their fair skin. For most, the main source of exposure to ultraviolet radiation is the sun. However, many people are exposed to high doses of ultraviolet radiation through artificial sources. Sunbeds and sunlamps used for tanning purposes are the main source of deliberate exposure to artificial ultraviolet radiation. All forms of such radiation contribute to skin cancer. There has been a growing body of evidence over recent years that the use of sunbeds, especially by children, should be restricted because of the associated increased risk of skin cancer and other health problems. In 2009, the World Health Organisation’s International Agency for Research on Cancer (IARC) reclassified sunbed use from a group 2A carcinogen – one that is probably carcinogenic to humans – to a group 1 carcinogen – one that is carcinogenic to humans. This means that ultraviolet radiation is a group 1 carcinogen which is carcinogenic to humans and which will cause cancer. • According to figures produced by the National Cancer Registry there were over 10,000 cases of skin cancer in 2011. • There are over 850 new cases of melanoma in Ireland each year. • Over 150 Irish people die each year from melanoma. • There were over 7,000 people alive with this type of cancer in 2011. • Data from the HSE indicates that the cost of treating skin cancer ranges from €6,000 to €10,000 per patient depending on the complexity of the disease. Recently new high oncology drugs such as Ipilimumab and Vemurafenib (an oral BRAF inhibitor) have become available for patients with progressive melanoma. The cost of these treatments can range from €50,000 to €100,000 per patient. There are around 60-80 patients per year with such advanced melanomas. • The incidence of cancer in Ireland is expected to double by 2040 and the fastest growing number of cancers are expected to be skin cancers. The Irish Cancer Society’s Sunsmart code provides useful advice for when the UV Index is at 3 or higher.